We have a special honey class in our state fair baking competition and I won for the cookies last year. I had never entered the honey cookies category before, but knew from looking at past year’s cookies what I wasn’t going to do, which was a flour-based cookie. I wanted to do something different that the other bakers hadn’t. 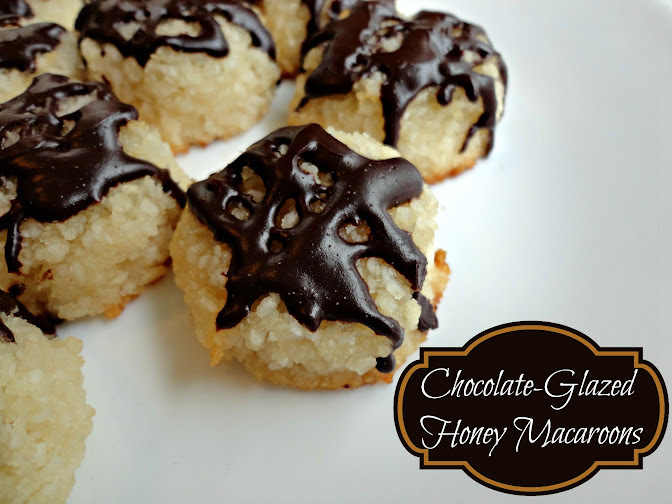 I did lots of brainstorming and finally decided that a honey coconut macaroon might be nice. Luckily I found a great recipe at Gourmande in the Kitchen and all I had to do was create a glaze for them. 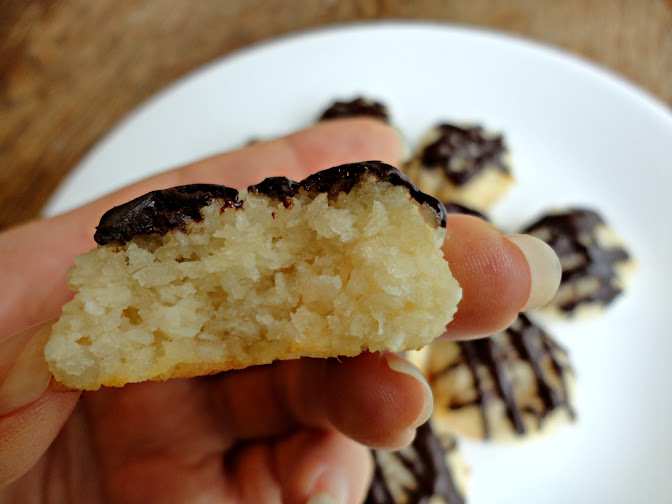 Less heavy than a normal macaroon, these are light, sweet, tender, and very moist. And the coconut-flavored chocolate just puts them over the top. I love these cookies because not only are they tasty, they also are allergy friendly (gluten-free, dairy-free) and healthy (good fat & naturally sweetened). I do hope you enjoy them! For more coconut oil recipes, check out my Coconut Oil Coffee, Coconut Chocolate Chunk Cookies, Vegan Gluten-Free Mounds Cake, Dairy-Free White Cupcakes, Homemade Magic Shell, and Vegan Dark Chocolate Cake Pops. Put oven rack in middle position and preheat to 400°F. Line a baking sheet with parchment paper; set aside. Process the coconut in a food processor until very fine. Whisk together egg whites, honey, vanilla, and salt until combined, then stir in the coconut until completely moistened. Using a small cookie scoop, portion out the dough onto the prepared baking sheet, about 2 inches apart. Bake until pale golden in spots, about 10 minutes. Transfer to a rack to cool completely. Make the Glaze: Place the chocolate in a small microwave-safe bowl and microwave for 30 seconds at 50% power. Stir, then repeat. Stir until residual heats melts the chocolate completely, then stir in the coconut oil and honey. Drizzle over the cooled macaroons and serve immediately, or allow to set before storing. It takes this glaze several hours to set up, but the cookies are so moist they will not suffer for being left out. Posted in Cookies and tagged blue ribbon, coconut macaroons, coconut oil, Cookies, dairy-free, first place, gluten-free, healthy, honey, naturally sweetened. Bookmark the permalink. Those look so good. :) My favorite cookies from the Cookie Exchange were the chocolate dipped coconut macaroon that I received. I am now drooling on my keyboard! I have those saved, and truly those were probably better. Keep in mind these were judged along with other honey cookies and, well, honey cookies just can not compare to sugar-sweetened cookies (IMHO). But they still are wonderful for honey cookies! Mmmm…I’ll have to try this when I am eating eggs again! Very cool Veronica that you got the BLUE RIBBON! You go girl! My husband would go insane over these, he’s a macaroon lover from way back! Thanks Veronica for sharing this very yummy recipe! I must try this too…well, after I lost 5kg…these are rich, chewy and coconutty…just my kind of cookies. I’m working on losing weight too but have 20 kg to lose–good luck! Yup! Check out my “award winning recipes” in my recipe index to see some more I’ve won ribbons for. There are still so many I need to add. Those look so delicious! I wish I had some to go with my coffee right now, I think that combo would be awesome. I’m amazed by how few ingredients they contain! The photographs make them look so beautiful! Sometimes it just takes a few ingredients to make something great. Thanks Diana! These sound awesome. Congrats on the Blue Ribbon! For the record, I love seeing something with a bite in it. I always want to see what’s on the inside! Me too, it is just so appealing to me, almost like I can taste it if I see that bite and i love seeing what the inside looks like too. I definitely don’t do enough with coconut oil, but this recipe is convincing me to change my ways! I mean, a blue ribbon winner? It’s a must-make! These are blue ribbon AND massive drool worthy. I can just imagine how they melt in ones mouth. Mmmmm. Oh, V. These look fantastic!